If you’re searching for a plumbing, heating, and air conditioning company in Chester, NJ, you’ve come to the right place! At Rite Rate Heating & Cooling, we provide plumbing and HVAC services for homes, businesses, and offices. We have experienced plumbers and contractors that handle all sorts of simple to complex problems such as frozen pipe repair, new air conditioner installation, and heating repair. As a licensed and experienced plumbing, air conditioning, and heating company in Chester, NJ, we guarantee customer satisfaction! Contact Rite Rate today for a free quote and we’ll be happy to assist you! Did your furnace suddenly stop working? Is there no hot water in your bathroom or kitchen? 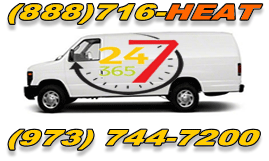 No matter if it’s on a weekend or during the night call Rite Rate 24/7 for emergency heating repair in Chester, NJ! Our heating company is on standby 24-hours a day in case you need your residential or commercial boiler, furnace, or hot water heater fixed. Rite Rate contractors also handle heater installations and replacements during which they’ll help you choose the right heater for your home or business. From heating repair to a new gas furnace installation, call our heating company anytime! Do you have a commercial or residential air conditioner that needs to be fixed? Do you need a new air conditioner installed but don’t know where to start? Let our air conditioning company in Chester, NJ handle it for you! At Rite Rate, we offer air conditioning installation, repair, and replacement. We can handle everything from 24-hour emergency AC repair to replacing a central air conditioning system. Our air conditioning company can service any central AC, ductless air conditioning, packaged air, heat pump, or air handler. We keep our air conditioning services affordable for all budget types and will be happy to offer you a free estimate! Say goodbye to clogged sinks, showers, and toilets, because we have got you covered! Rite Rate is a 24-hour emergency plumber and can fix any residential or commercial plumbing system. We will handle the simplest toilet repair to complex sewer cleaning. Our professionals are trained to work with all kinds of plumbing fixture such as sump pumps, faucets, drains, pipes, sinks, bathtubs, and showers. You can rely on us to fix a frozen pipe or installing a new toilet. Whatever plumbing service you require, Rite Rate has the solution!